Google thumbed its nose at Europe’s “Right to be Forgotten” laws in Lisbon on Tuesday, noting that it will not honor de-listing requests beyond country specific domains. The tech giant’s stance is considered an affront to privacy by some individuals, while others consider it a protection of free speech. Enforced by EU data privacy laws, “Right to be Forgotten” forces Google and other search engines to remove negative listings – regardless of their accuracy – from search pages. On the first day it went into effect on May 30th, 2014, Google received over 12,000 removal requests, many of which pertained to criminal records and unflattering press coverage. An additional 70,000 requests were filed within the next two months. A new agenda, titled Article 29, would extend coverage of “Right to be Forgotten” to .com domains. As RTBF only applies to country specific domains within the EU for now, the mandate holds no water in the United States. However, it does raise some important questions about freedom of speech in the 21st century. Namely: Do the risks of full transparency outweigh the benefits? On the one hand, a fully transparent web allows misinformation to share the limelight with legitimate facts. Review sites are a perfect example of this, as many of these sites rely upon user-submitted content, which – under the Communications Decency Act – protects them from the legal repercussions that would typically arise from publishing slanderous or defamatory content. As a result, they are teeming with internet “trolls” and disenfranchised individuals who get their kicks from spreading defamatory comments and outright lies. There have even been reports of businesses using these sites as a platform to vilify their competition. On the other hand, having the ability to remove information from the web is a slippery slope with extremely worrisome implications for press freedom and overall access to knowledge. Imagine a world in which scam artists and violent criminals could effectively hide any information they’d like to hide and you start to understand why Google is so committed to quarantining RTBF to Europe. While the issue is undoubtedly complicated, the challenges of full transparency seem less concerning than the dangers of what is essentially a censored web. Sure, individuals and brands will have to put a little more thought into their online personas, and some will always be haunted by previous mistakes. But doesn’t that seem like a small price to pay in the grand scheme of things? It’s not as if every negative story or review is a lost cause that will wreak havoc on your name or your brand’s image. 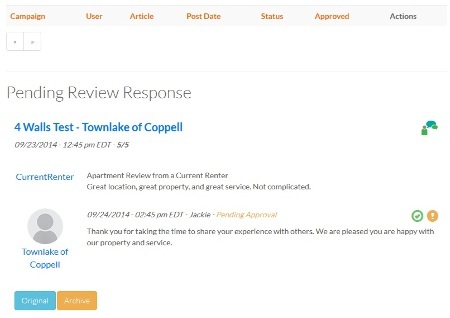 Review Response, a Respage service offering that creates custom responses to posts and comments on review sites, is a great example of how brands can turn negative publicity into an opportunity to reestablish credibility. And consumers tend to trust brands that address their faults over brands that try to cover things up. The fact that the European Union continues to attack free speech is disheartening, but Google’s decision to fight EU Article 29 is proof that the search giant has no desire to change its First Amendment views. They are an American company, after all.